The enemy of my enemy is my friend. The mid-50’s and 60’s saw incremental improvement in the overall social standing for African-Americans, though there are still battles to be fought as the calendar turns into the 70’s. 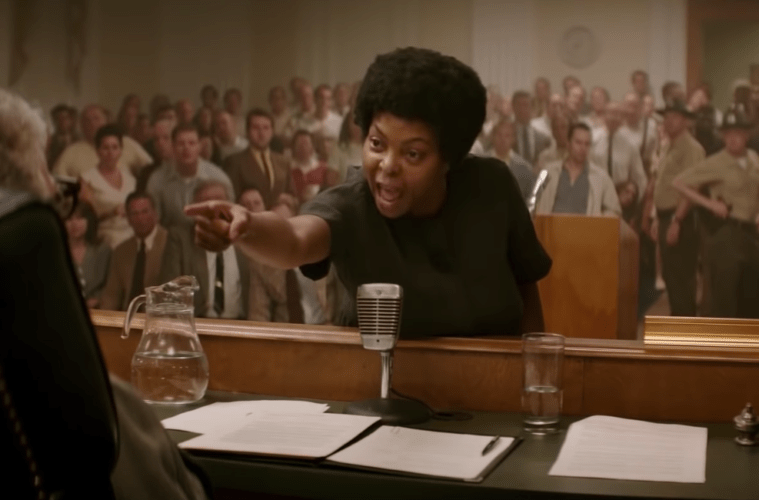 Activist Ann Atwater (Taraji P. Henson) continues to fight in 1971 Durham, North Carolina, earning the nickname “Roughhouse” as she’s not one to back down or be timid in the face of injustice. Those injustices are almost always systemic, backed by those in the majority. Many of the most powerful public citizens in the city are either card-carrying members of the Ku Klux Klan or low-key supporters, often relying on leader C.P. Ellis (Sam Rockwell) to quell any potential uprising by the “other.” Ellis is very much Atwater’s nemesis and vice versa. The latest situation involves the potential desegregation of the local schools after one all-black school burned halfway, leaving those children to attend school on three-hour shifts and becoming well-behind in the process. Something’s got to give with no side ready to concede. The solution? A charrette mediated by social scientist Bill Riddick (Babou Ceesay) designed to help each side find common ground. For two weeks, Ellis, Atwater, blacks, and whites will determine what the future educational system in Durham looks like. One could see if The Best of Enemies were thought of as Green Book 2.0. Akin to that movie about shifting race perceptions, two pretty solid acting jobs by thespians who consistently deliver in what they appear in are present. And like that movie, it’s got an ending that is Disney-level saccharine; it’s hard not to smile when the credits roll (real-life footage of Atwater and Ellis is a touching addition). Overall, The Best of Enemies is another functionally fine, feel good race relations movie. Longtime producer Robin Bissell gets his first crack at directing here. Outside of a heavy reliance of cross-dissolve montages set to musical tracks, it’s a relatively steady 1970’s Deep South re-creation effort for the debut shot-crafter; nothing woeful or wow-inducing. Also serving as writer, Bissell adapts from the biography The Best of Enemies: Race and Redemption in the New South, hewing to the facts and letting the story about acceptance, evolving beliefs, and inclusion, both from an obvious perspective and a surprisingly valid perspective coming from Ellis, speak for itself. Everything that occurs on screen feels like it happened, or at the very least not embellished beyond belief, and that is refreshing to see out of a “fact-driven,” “based on a true story” production. Where The Best of Enemies struggles most—and sometimes mightily—is in pacing and jagged editing. Nothing is wrong with a two hour and thirteen-minute film if it’s justifiable. 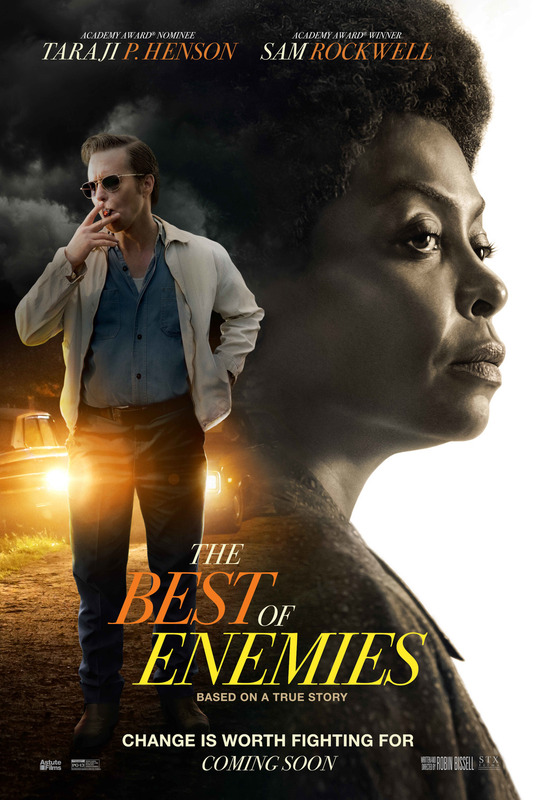 The Best of Enemies feels about 15-20 minutes too lengthy, taking more time than necessary to exhibit the actions some people will go to ensure power remains in the hands of the privileged, with one prolonged and sort of forced scene making a clear parallel to someone today who wields a ton of it. And it goes without saying that there are no surprises that happen in the feature and those uninitiated to the Ellis vs. Atwater story are smart enough to know what the destination will look like. So, it’s simply a matter of how the film builds to its climax, and the construction to this is semi-rushed even with a lengthy run-time, making the payoff (still crowd rousing, mind you) feel not as poignant as it could and probably should be. When watching The Best of Enemies, the thought entered yours truly’s head that certain stretches may have worked better as a Broadway play than a full-length movie. Henson remains one of the most charismatic and energetic talents today, and she’s gone on record saying she used Tyler Perry’s Madea character to serve as a rough template for her portrayal on Atwater. Eight times out of ten, she’s very tapped into the emotional aspects of the famed activist. However, just enough instances exist, whether via interpretation or the sort-of-comical prosthetics, in which Atwater comes off as a sibling, “stage-y” caricature of those Perry installments as opposed to a realistic character. In totality, Henson’s a net positive acting alongside Rockwell. His second turn in three years starring as a racist seemingly beyond rehabilitation is actually stronger than the role that netted him a Best Supporting Actor. Tons of depth and sides exist to C.P., and the actor gives a nuanced and fully assimilated performance that manages to show shreds of humanity during the KKK leader’s most despicable displays of racism. One of 2019’s early best. Clearly this is a two-star movie, but Ceesay is sneaky good, holding his own serving as the fulcrum of the historical event. The strongest enemies can make the best of friends. Sound performances power The Best of Enemies past a few structural issues into a zone of recommendation. Photo credits go to slashfilm.com, IMDB.com, traileraddict.com, and newsobserver.com. Fine review. You know where I land on it but I do want to jump in with you on Ceesay. “Sneaky good” indeed. It’s such a good supporting performance. He’ll be the forgotten man in this movie but he’s got a more important role than people might realize.